“…Stanford and his co-defendants engaged in a scheme to defraud investors who purchased approximately seven billion dollars in certificates of deposit, cds, and administered by Stanford International Bank Limited, an offshore bank controlled by Stanford and located in the island of Antigua. According to the indictment, Stanford and his co-defendants allegedly misused and misappropriated most of those investment assets, including diverting at least 1.6 billion dollars into undisclosed personal loans to Stanford himself. All the while, Stanford and his co-conspirators allegedly misrepresented to investors the financial condition of Stanford International Bank, its investment strategy and the extent of regulatory oversight by the Antigua authorities. The indictment charges Stanford with conspiracy to commit wire fraud, mail fraud and securities fraud. Seven counts of wire fraud, ten counts of mail fraud, conspiracy to obstruct an investigation by the FTC, obstruction of an investigation by the FTC, and conspiracy to commit money laundering. Mr. Stanford was taken into custody by Federal agents in Virginia last night. Also charged today and arrested this morning in Houston was Gilberto Lopez, the Stanford Financial Group’s Chief Accounting Officer, and Mark Kuhrt, the global controller for Stanford Financial Group Management. All are expected to make court appearances this afternoon (Friday). When government officials receive “gifts” from business it just has to influence their decisions and loyalties. I mean, why do corporations give these “gifts” in the first place? When the “gifts” ramp up with vacations, jobs for government officials’ family members, scholarships over and away for their children, the use of corporate business jets and cash, WELL… government officials soon forget about their duty to the public. That is why corporations give “gifts” to government officials. So it was with Mr. Leroy King, head of the Antigua and Barbuda Financial Services Regulatory Commission (FSRC), who now stands charged with being a “key inside collaborator” assisting SIR Allen Stanford to commit a US$7 billion dollar fraud and money laundering. It just goes to show how little it takes to buy a country’s integrity and reputation – which is exactly what Sir Allen Stanford did when Antigua said his bank was solid. Mr. King received “gifts” from Sir Allen Stanford including jet rides, vacations, cash and treats of expensive entertainment like Super Bowl tickets. How much cash? According to the news media, a paltry $100,000. Chicken feed for Sir Allen, but no small sum for me, you or any government official. … until it tumbled like a house of cards. 1/ Both companies were under Government Regulations & Oversight. Stanford & CLICO were supposedly well regulated by government authorities – Stanford by Antigua, and CLICO by Barbados. 2/Both companies and their upper-level executives maintained close relations personally with individual politicians and corporately with the same government that was supposed to be regulating their activities and standards. In Barbados, CLICO CEO Leroy Parris and Prime Minister David Thompson are so close that they are Godfathers to each other’s child! 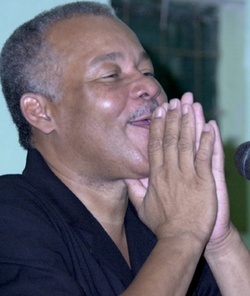 Ex-PM Owen Arthur "Just let the FBI be blind to my Swiss accounts, Oh Lawd!" 3/ Both companies were heavily involved in politics and funding political campaigns. In the USA, Stanford provided millions to both the Republicans and the Democrats – covering all bets by backing both John McCain and Barack Obama in the last Presidential election! Only God knows how much Stanford gave to Antigua and Barbados politicians. The same God might also know how much CLICO gave to the BLP and the DLP, including Prime Minister Thompson’s last campaign… because campaign donations in Barbados are kept secret from the citizens. 4/ Government officials and politicians used company business jets. In Antigua the head of the Antigua and Barbuda Financial Services Regulatory Commission used Sir Allen’s jets. In Barbados, Prime Minister David Thompson used CLICO’s private jet. 5/ Years in advance, there were reports and signs of trouble brewing that were ignored and covered-up by the respective government agencies and the politicians in power. 6/ Both companies were allowed to break various government laws and requirements to file financial records and audits. In Antigua, government officials allowed faked outside audit reports and even faked government audits. In Barbados, under both the current David Thompson DLP government and the past Arthur/Mottley BLP government, CLICO was allowed to violate laws respecting reserves and financial integrity of insurance companies. 7/ Both Stanford companies and CLICO “invested” in risky property deals and provided highly irregular loans for such “investments” to associated companies – sometimes paying much more for land than the true value. These actions transferred company funds to other entities and people even as investors were told their funds were safe in highly liquid and conservative assets. In Barbados, CLICO provided loans to other CL Financial companies that paid hundreds of millions of dollars for Florida swampland that wasn’t worth anywhere near the purchase price… and kickbacks were paid to CL Financial / CLICO company officials! EXCLUSIVE REPORT BY BFP: CL Financial Group Collapse – Insiders Took Bribes To Have Company Purchase Land For More Than Market Value! 8/ Politicians approved unusual land deals for both companies. In Antigua, Stanford’s companies purchased and developed lands where others had been unable to obtain permissions. In Barbados, CLICO did many questionable land deals and was not challenged when it allowed a Barbados national heritage site – Sam Lord’s Castle – to deteriorate beyond saving. In another deal with the devil, CLICO’s land holdings in the Graeme Hall Wetlands were excluded from RAMSAR protection by the BLP government. Subsequently, the DLP government changed the law to allow building on the Graeme Hall wetlands. 9/ Government officials and politicians continued to defend both companies and their upper executives long after it was obvious to everyone that something was rotten. 10/ Even after the scandals broke, Government officials and others took action to protect themselves and their friends in high places. In Antigua, the head of the Antigua and Barbuda Financial Services Regulatory Commission falsified audits. In Florida, Stanford’s security staff shredded bank documents after a court order freezing the business records. In Barbados, Prime Minister David Thompson refused to allow the supervisor of insurance to take over CLICO. Instead, and without any legal authority to do so, Thompson appointed a group of “special” people to a board to oversee CLICO’s operations because he couldn’t afford to lose control to the courts. Antigua has integrity legislation, so presumably Mr. Leroy King, as a government official and head of the Antigua and Barbuda Financial Services Regulatory Commission, could not receive gifts legally from Sir Allan Stanford. Contrast the situation in Antigua with that of Barbados where it is perfectly legal for elected and appointed government officials to accept “gifts” from persons or entities they deal with in government service. In fact, we have no Integrity Legislation or conflicts of interest laws that prohibit government officials from profiting from their position. Heck, it is perfectly legal for Barbados government officials to award government contracts to themselves or their immediate family members! Prime Minister Thompson and the DLP promised to implement Integrity Legislation within 100 days of being elected and to implement a Ministerial Code immediately that would define and prohibit conflicts of interest for government officials. Now a year and a half after the DLP took power, it is widely acknowledged that the DLP and David Thompson lied about Integrity Legislation, Freedom of Information laws and conflicts of interest rules. 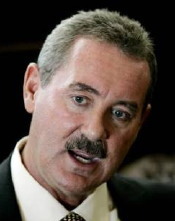 No word yet from either the Barbados Labour Party or the Democratic Labour Party as to how much in “campaign donations” they received from Sir Allen Stanford over the years. No sir… the DLP and the BLP are pretty quiet on that one!